So all classic tools give up… but that’s ok, let’s gdb-attach the process..
A syntax error in expression, near `$rip'. That’s the real fun. No matter what I did to that binary, I never managed to make gdb attach to it in 64 bits mode. I tried to make the binary unreadable (chmod 100) or to patch the missing fields/sections but it did not good. I lost too much time on this one (btw if you managed to make gdb work on this, I’d appreciate a lot). Time to launch IDA. We discover a dynamically loadable executable that’s linked to libpthread and libc. 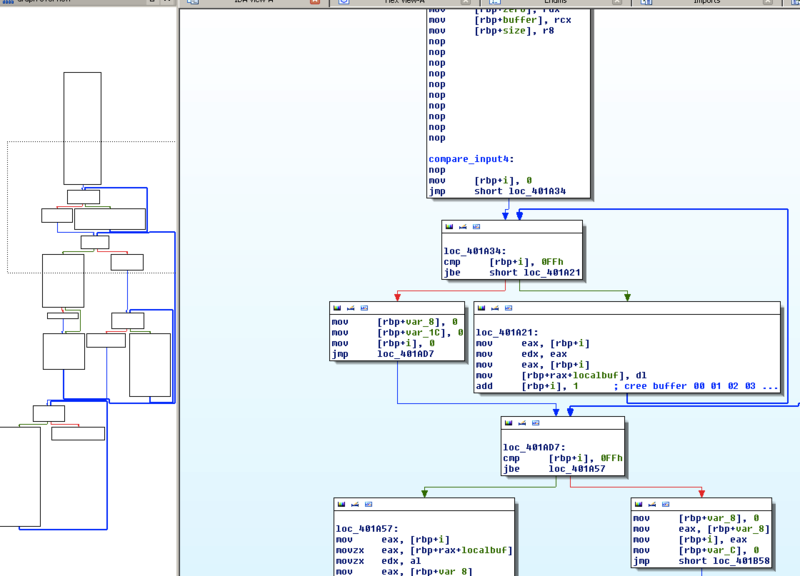 Since the section header table is broken, IDA was not able to match the PLT and GOT entries with that of the binary. However it was smart enough to see a list of exports. We see very classic things for such a binary (open, socket, bind, listen, accept, read, write, close, printf, …) and other more unusual (pthread_mutex_lock). At which point I freaked out it would be a very hard to understand multithreaded program, as I had no debugger yet. This gave me the return addresses of many libc functions, and I was able to rename the PLT entries according to them. from that moment, reversing the binary was piece of cake, if we except the many anti-debugger patterns found into the code. I only removed the patterns at the places that made the local variables resolutions hard for IDA when it was important to me. 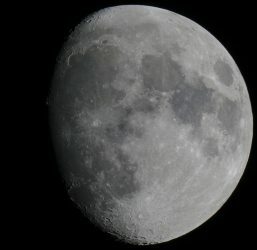 Go ahead, 0x90 all that crap ! I found an easy way to dump the content of the key file. The two ciphers code on the left must be the value parsed by atoi, and the one on the right must be the right value. Doing so tentatives shows that the server is going to tell you if your encrypted input matches the begin of the token from the list. The exploit follows. (also on pastebin with a better presentation). 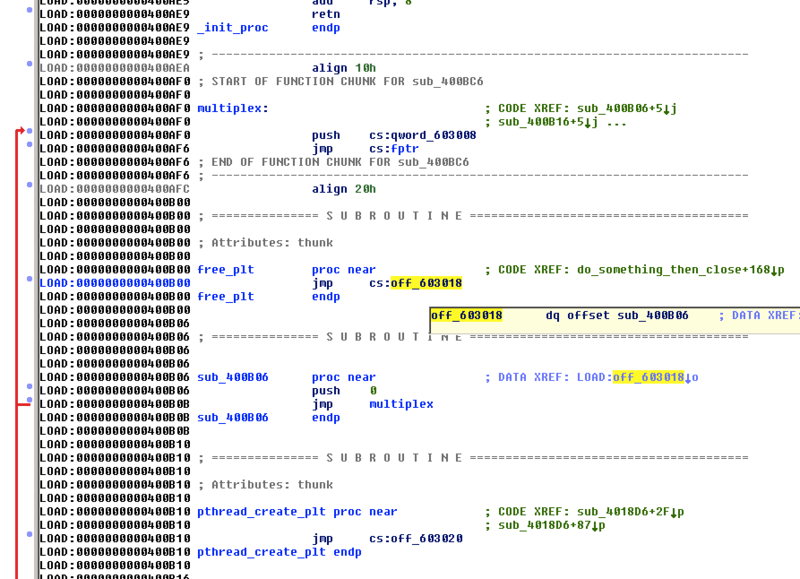 "d3 5c cc 9c d8 fc 1d 9e 44 a4 25 a8 5f cb fa 96"
Notes on debugger: while the write-up lets think I did not use a debugger, I extensively used EDB. Its main pros are : “not GDB”. Its main weakness is : “not GDB”. It was unfortunately not very stable and I couldn’t save a session or breakpoints for later use. Also, it sometimes confused .text/.data and refused to set my breakpoint because it thought it was in .data. Well, still better than opening core files in gdb. 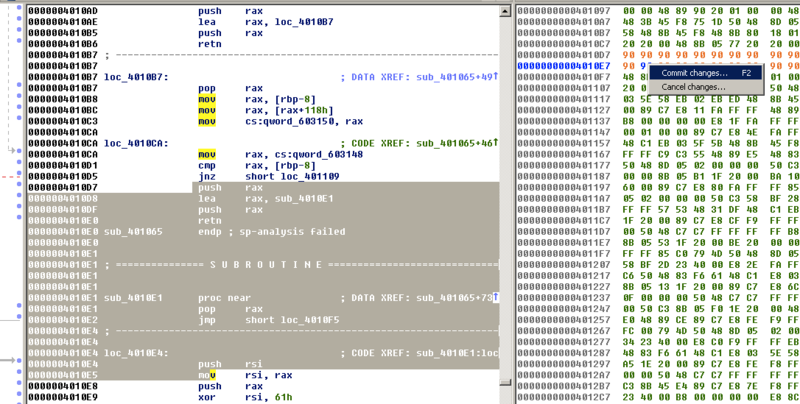 – Trying to patch the binary to make it acceptable for GDB, objdump & friends. 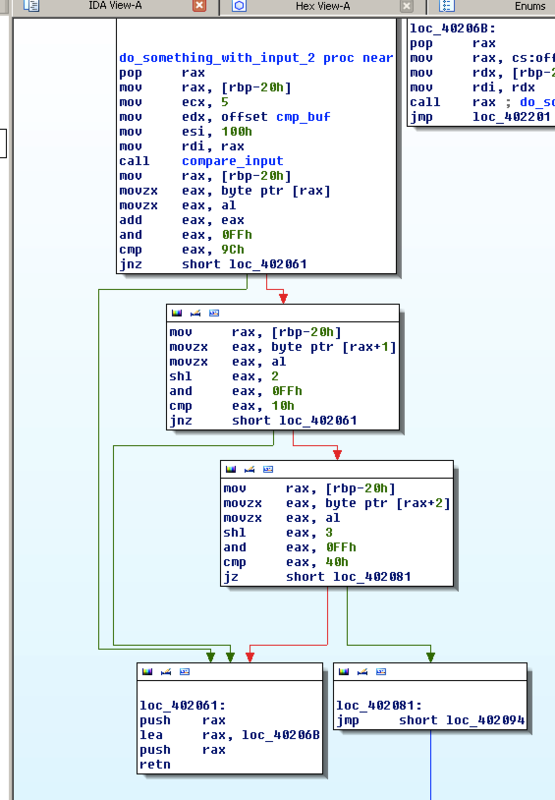 I still haven’t found why ld.so can read the file fine and not bfd tools or IDA. Next PostNext The war against autocomplete=off: let my browser remember passwords !